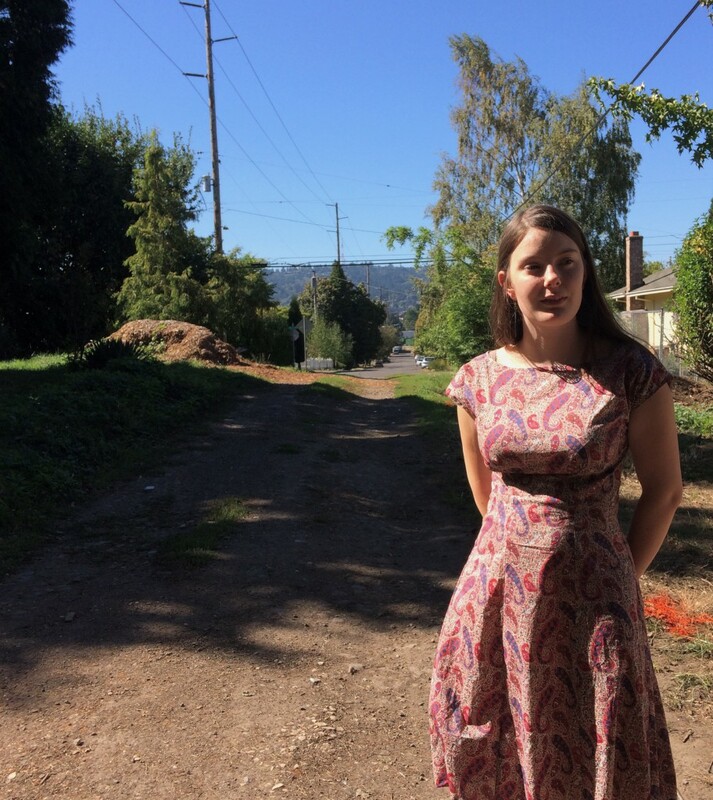 This summer, I dreamed of shift dresses. 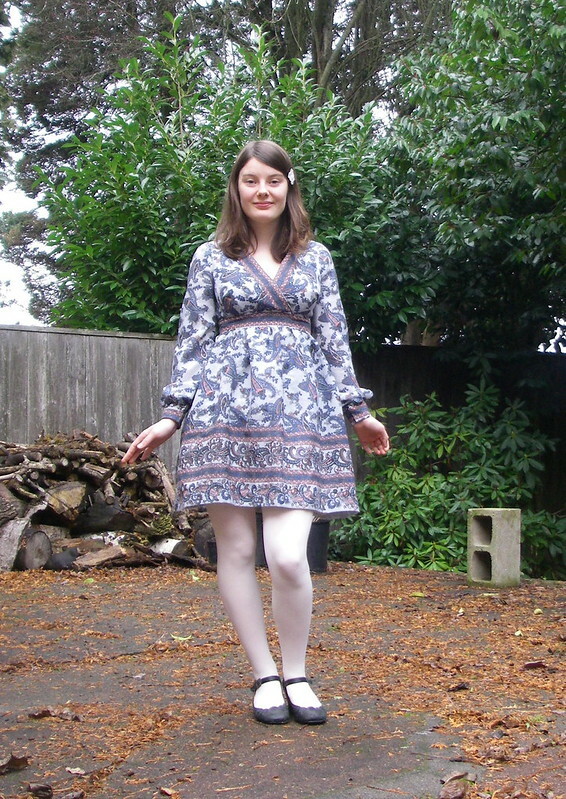 Big 60s florals, bell sleeves, mini hems! 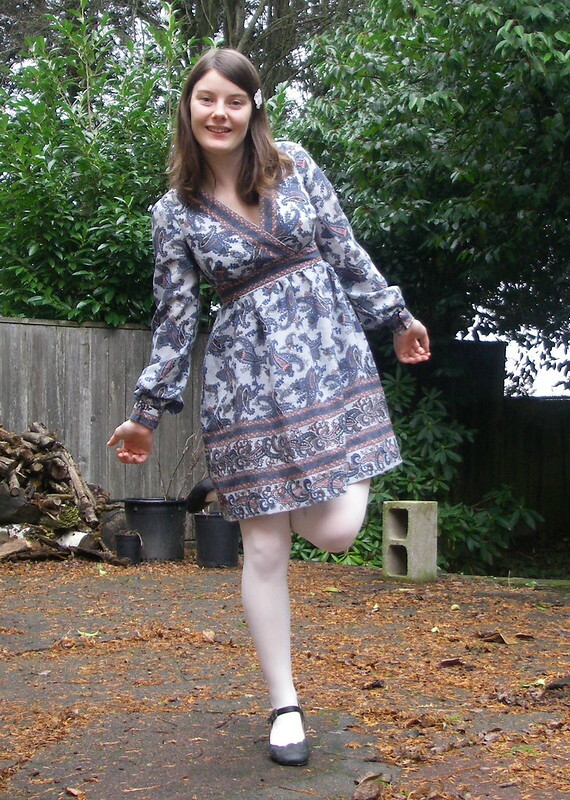 The actual 60s patterns in my stash had been purchased without a true sense of my own measurements, so I turned to the Sewaholic Alma to satisfy my shift dress fantasies, extending the hem to a suitably mini-dress length. 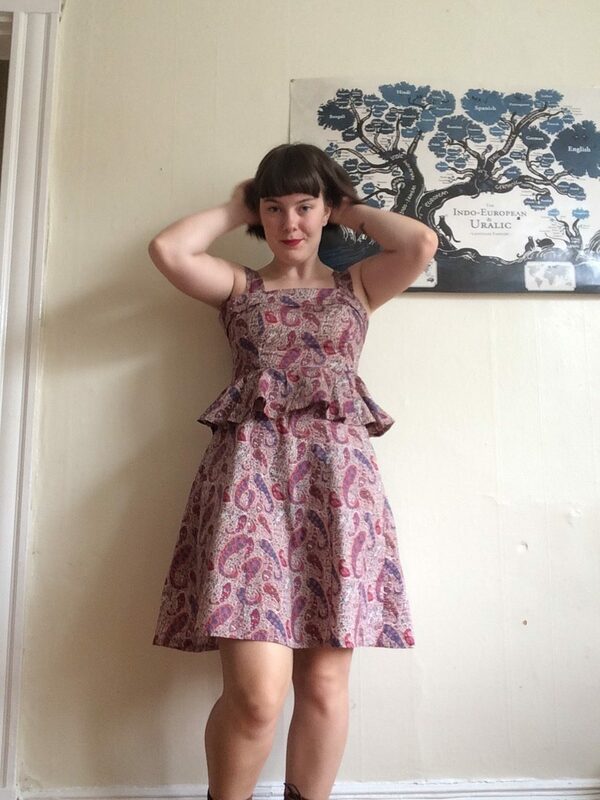 I cut according to my full bust measurement instead of trying to fiddle around with FBAs and guessing at cup sizes, and it fit surprisingly well out of the envelope–except for the sleeves, which I quickly dispensed with in the name of 90-degree days. 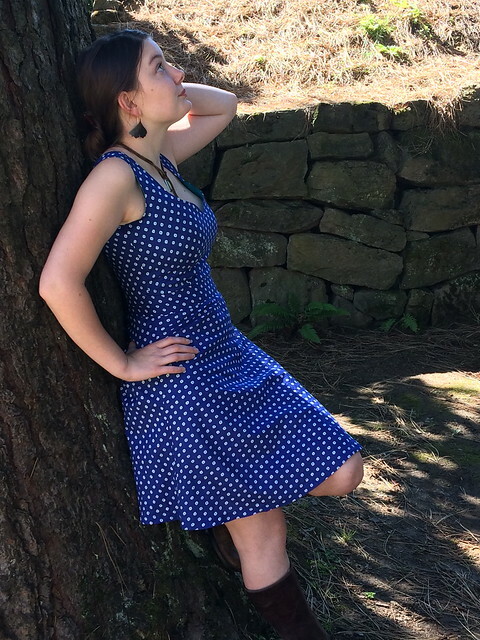 My first version was sewn up in a bold, blue-and-white, surreal floral, but the fit needed tweaking (more fullness at the hips, less at the waist) and the color didn’t feel “me,” so I gave that dress to a friend and shifted my vision from mod to hipster. 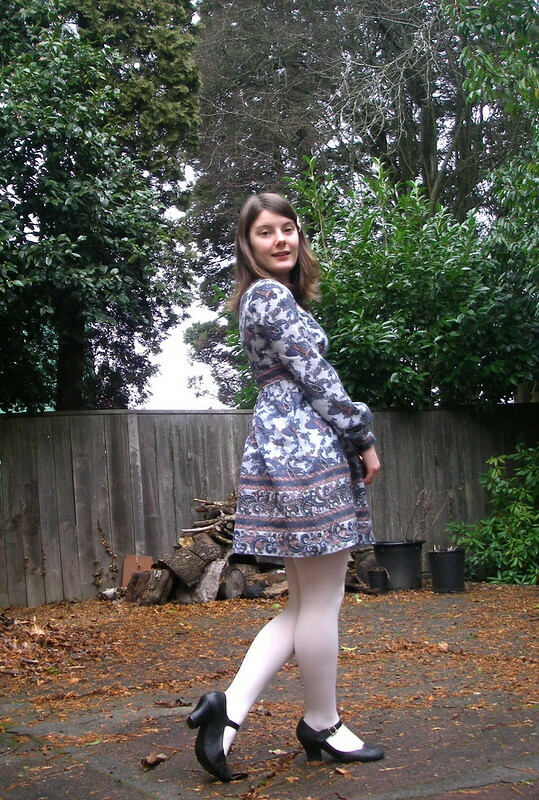 This dress then, is my second shot at the shift dress style and it’s been a huge hit. 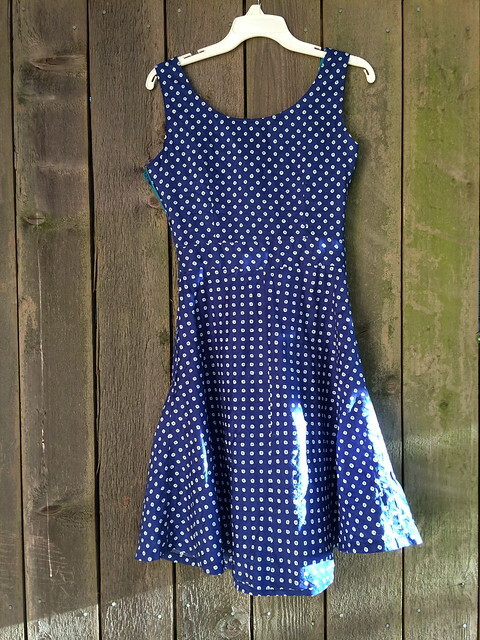 Simple and versatile in a navy swiss dot, I can wear it with sandals and pendant necklaces in the heat, and cardigans and oxfords when it’s gray and drizzly. 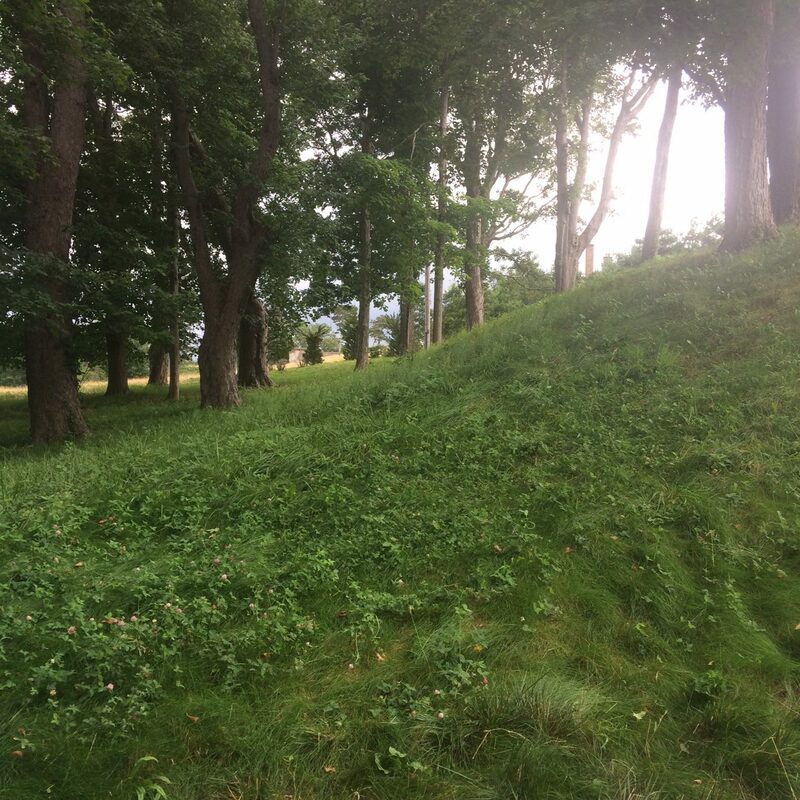 In fact, it’s been in such heavy rotation this summer that it’s already starting to fade around the seams and across the bust where my purse strap rubbed against wet fabric in a summer storm. I’m not sure how much longer it will last, but I do know I will my making another version when it finally does give out! 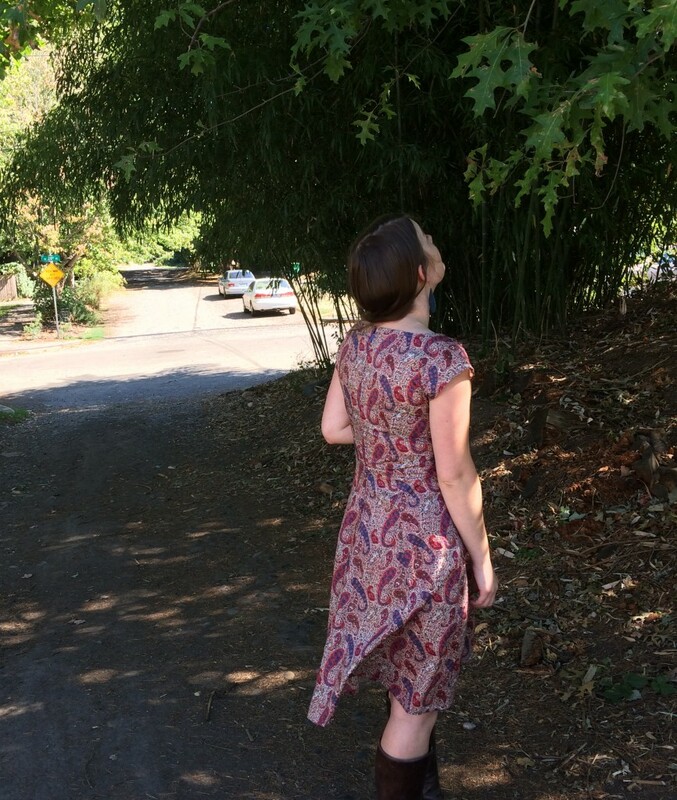 The pattern is the Sewaholic Alma, but I grafted on the sleeves of the Anna dress and mashed the necklines together for something a little broader and shallower than the Alma. Obviously the hem has been lengthened considerably (I can’t remember how much), but I tried to keep the lovely curved shape of the shirt hem. I omitted the zipper, as it slips over my head easily, french seamed the insides, and bound the neckline and sleeves in my Liberty bias-tape. The whole process from start to finish couldn’t have taken more than a few hours–as close as it gets to instant gratification! 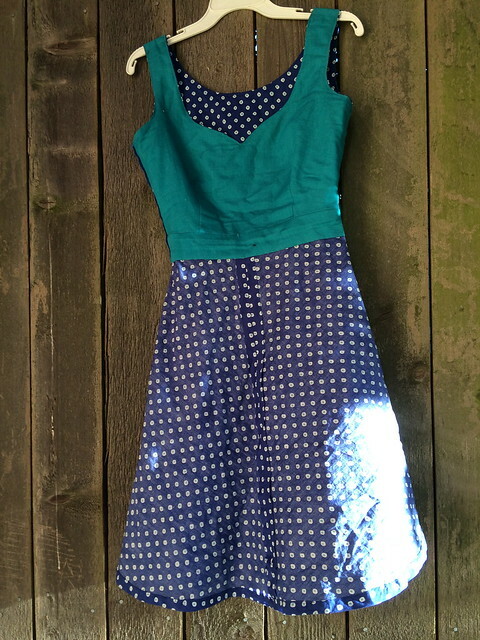 This entry was posted in sewing and tagged alma blouse, anna dress, dress, sewn on September 6, 2016 by Alice. 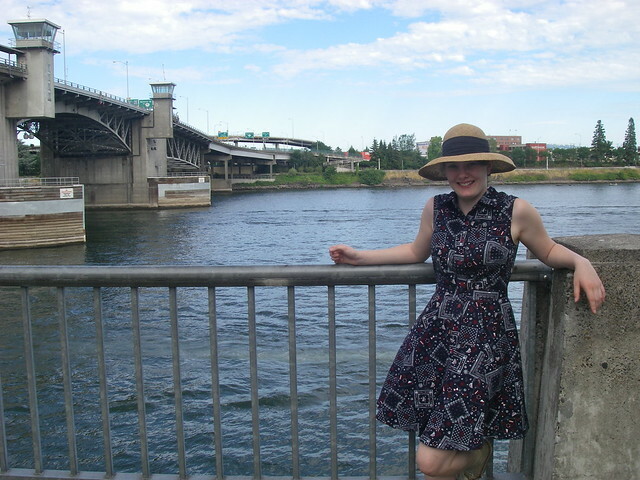 This dress was the labor of more or less an entire semester, plugged away at in bits and pieces for a couple of months. It’s been finished for a couple of months, and I wear it often, but I only now have got around to taking pictures. It’s even harder than usual in winter, as the light goes so quickly. 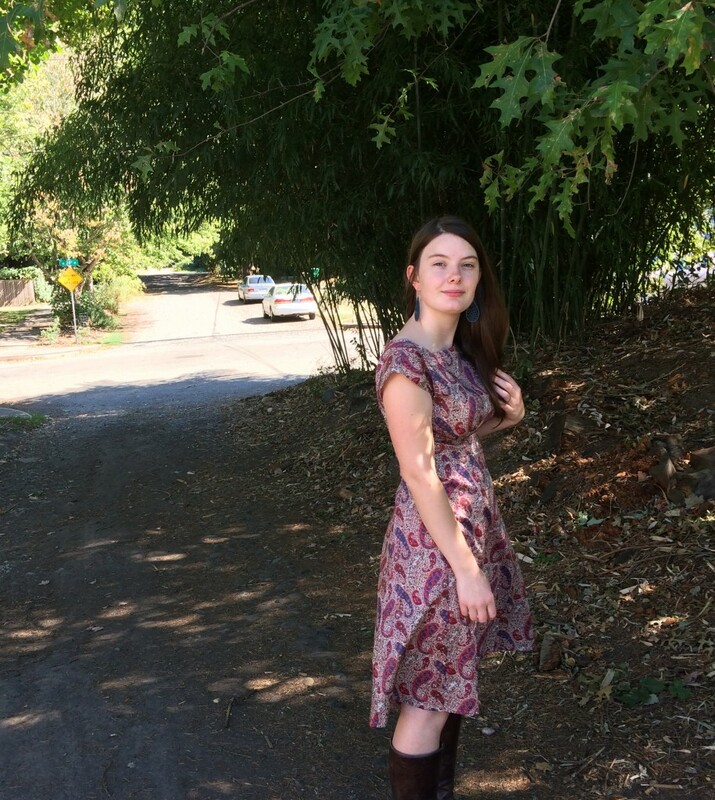 I wanted to make a comfortable, simple dress that could be worn with layers and boots for winter. 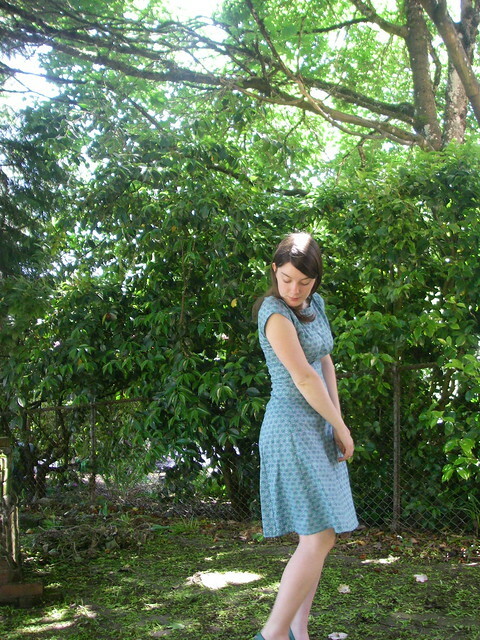 My ideal winter silhouette is a short, a-line dress with long or three-quarter sleeves, ideally cuffed. 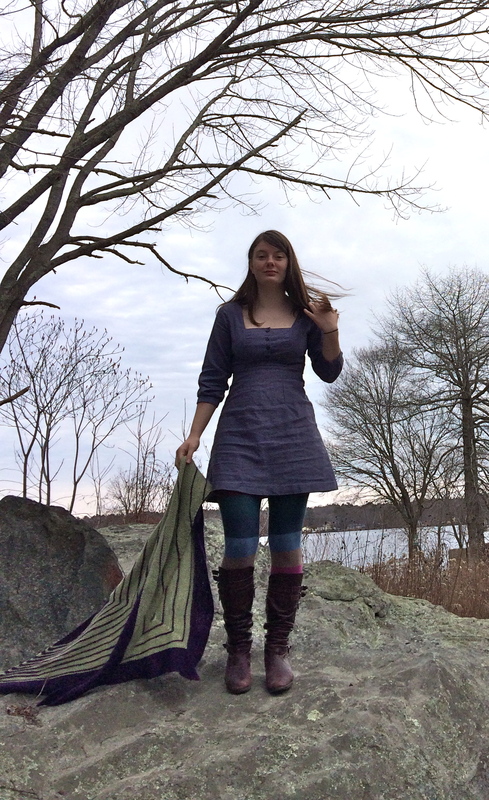 I love sweater dresses but I can’t seem to find good sweater-knit fabric anywhere, so woven it is. 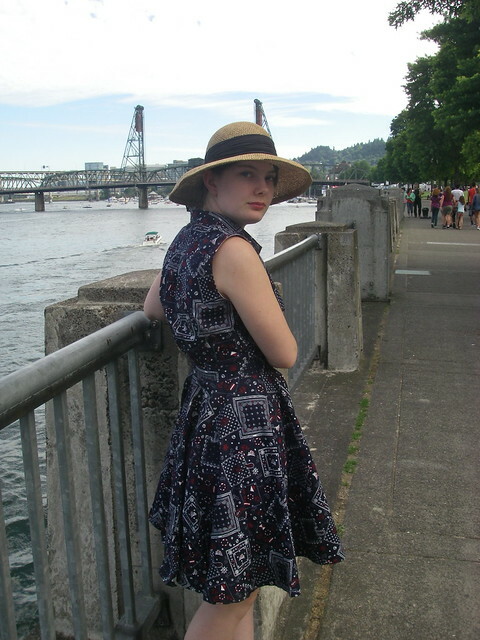 The pattern is the Sew Liberated Ashland, which I initially was not too keen on, but I wear my other version fairly regularly, so I guess I’ve been won over. The fabric is an extra-long twin bedsheet, but I’m pretty sure it’s sateen. It’s 100% cotton, anyway. 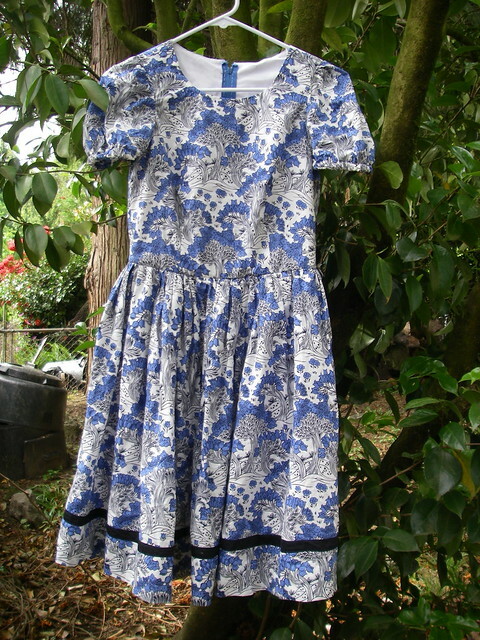 I sewed the same size as before, size 2, D cup, and my only real issue came with adding the sleeves. 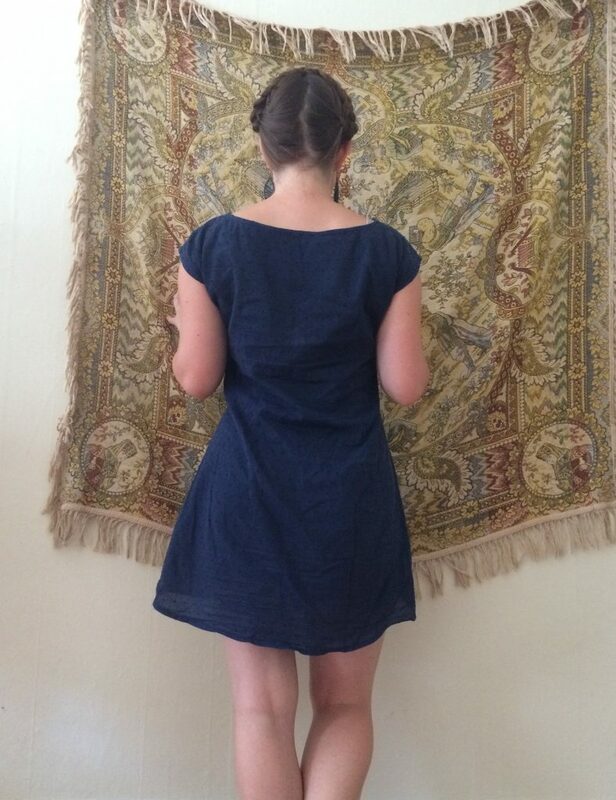 When I finished the dress I couldn’t put it on! 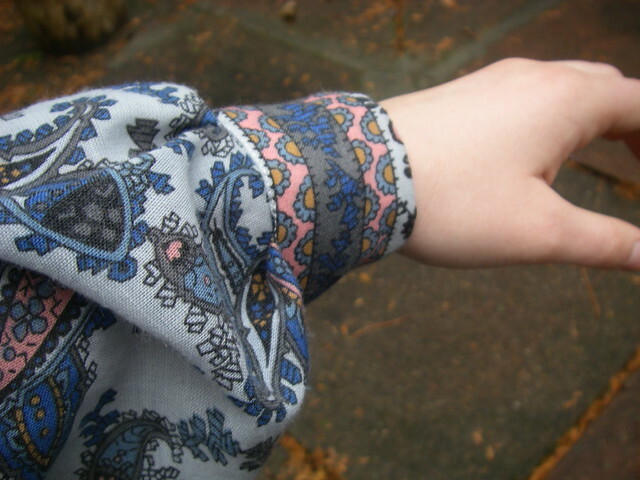 I could barely wriggle my arms into the sleeves and couldn’t raise them at all. I did an upper arm adjustment to add an inch, but I could add more. 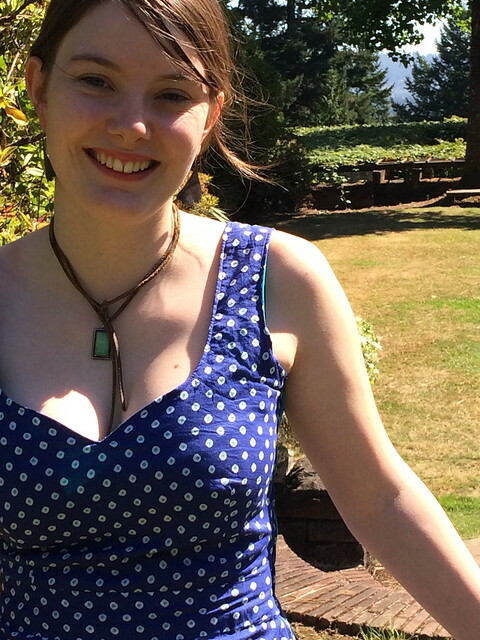 One thing I’ve also noticed is that the bodice ends about half an inch above the underwire of my bra, so I could probably safely size up to a 4. The shoulders seem about right though. I don’t have any pictures of the guts, as they’re not really much to look at, but they’re sturdy. 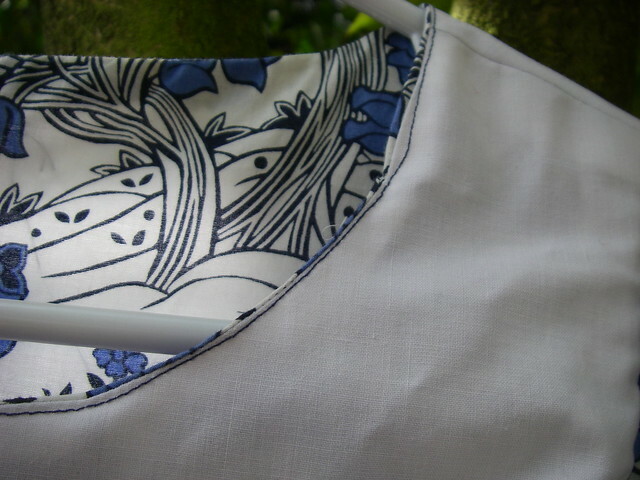 I used a combination of lining, handsewing, bias binding, and zig zag (now that I finally got my zigzag machine to work! I have to warm it up with a hairdryer before use). 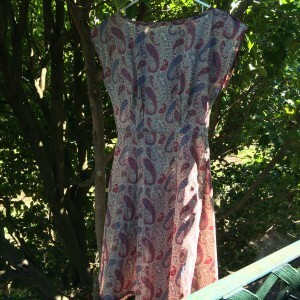 I’ve washed the dress a couple of times and it’s holding up well. 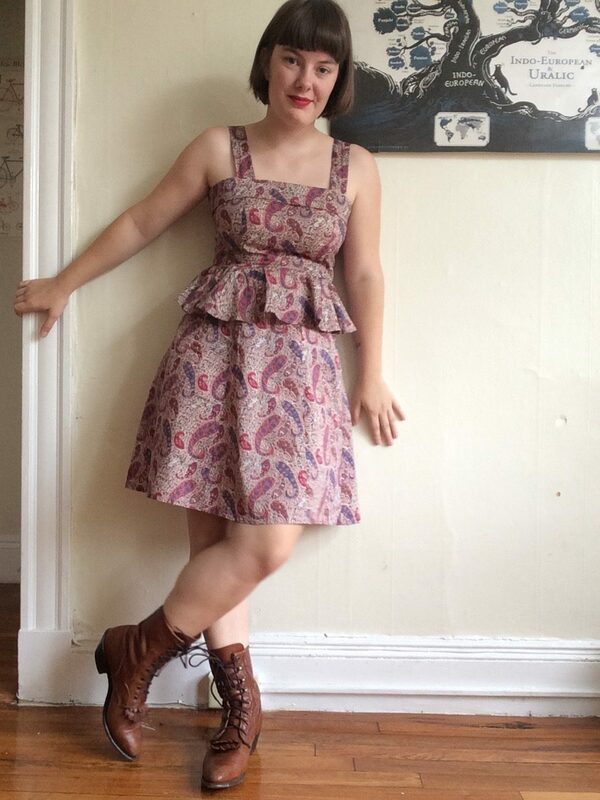 This dress is more or less exactly what I wanted it to be. 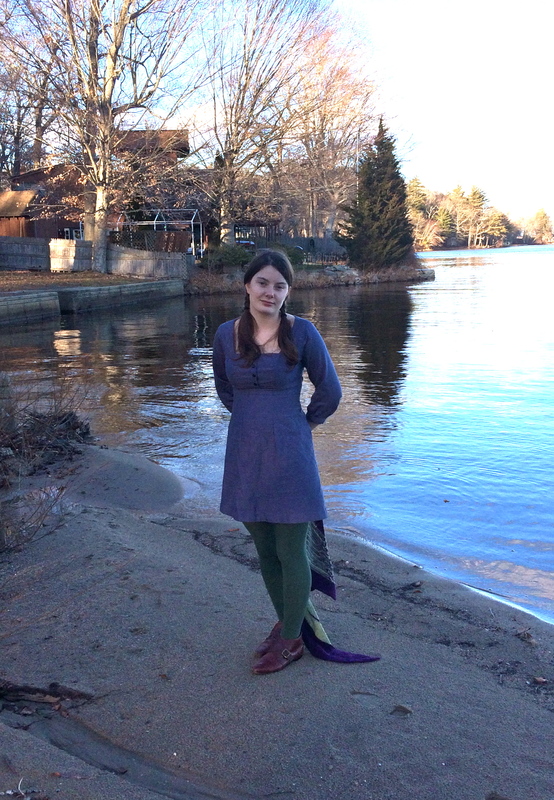 It’s simple, pretty comfortable, and goes well with a variety of tights, scarves, and sweaters. 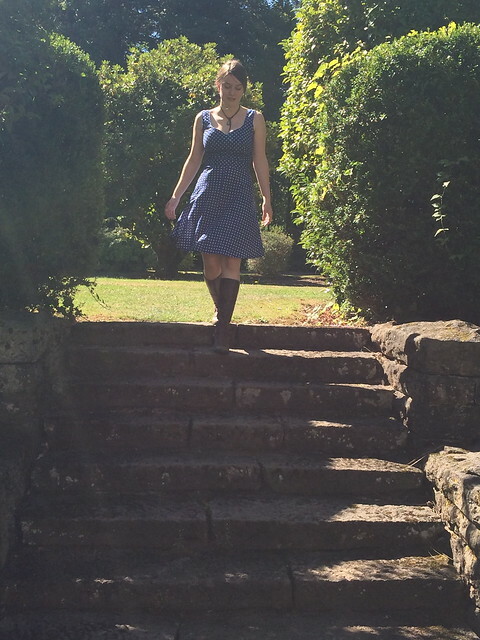 I never feel like I’m lacking the right shoes or coat or accessories to make an outfit with the dress, which makes it the sort of easy-to-wear piece I want more of in my wardrobe. 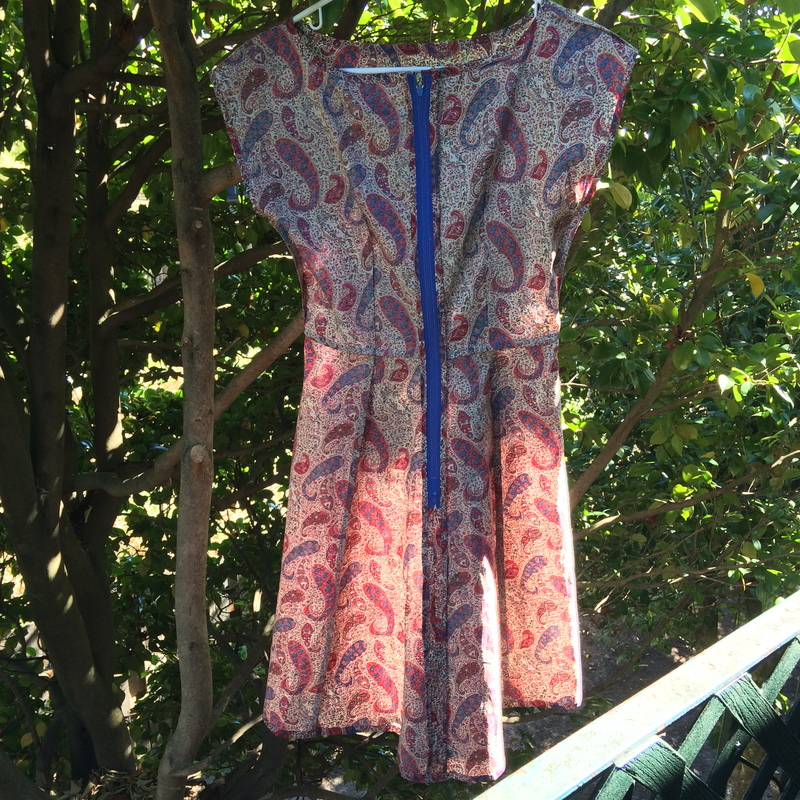 This entry was posted in sewing and tagged ashland dress, dress, sewn on January 5, 2015 by Alice. 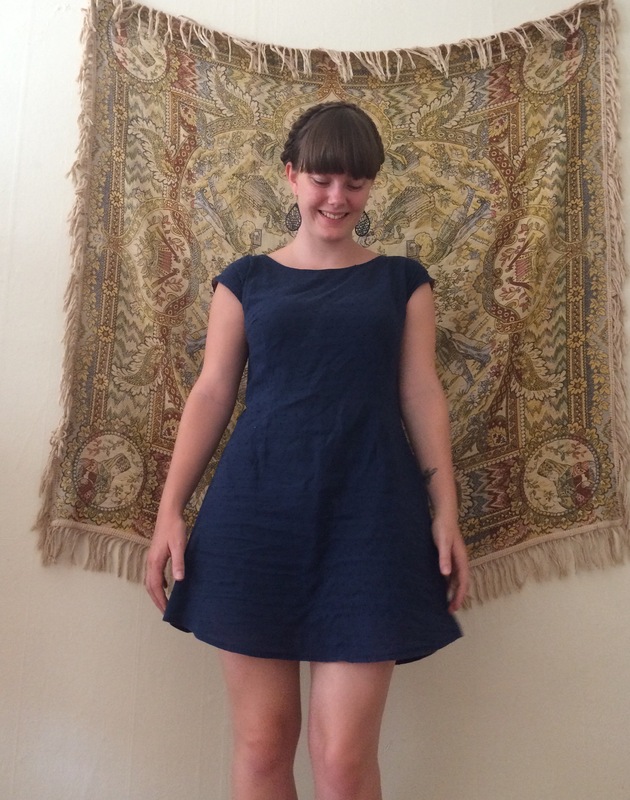 It seems as though nearly everything I sewed this summer was blue. 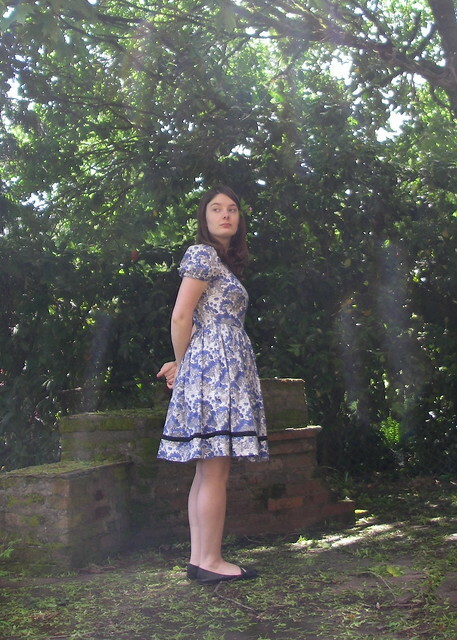 My Lisette lawn Anna, my Alice dress (since disassembled and waiting for pattern inspiration to strike), my nautical shirtdress, two bridesmaid dresses for my friend’s wedding… And this dress, which I actually made over a month ago for the Summer Sundress Sewalong, but am only just blogging now! 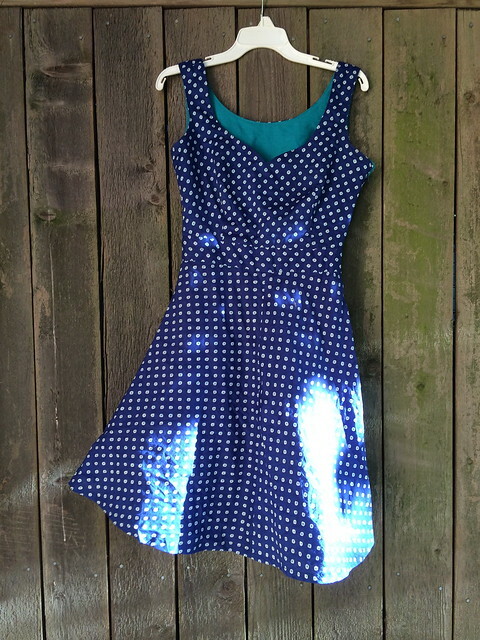 In the middle of sewing the bridesmaid dresses, I decided that I wanted to sew myself something. Naturally. 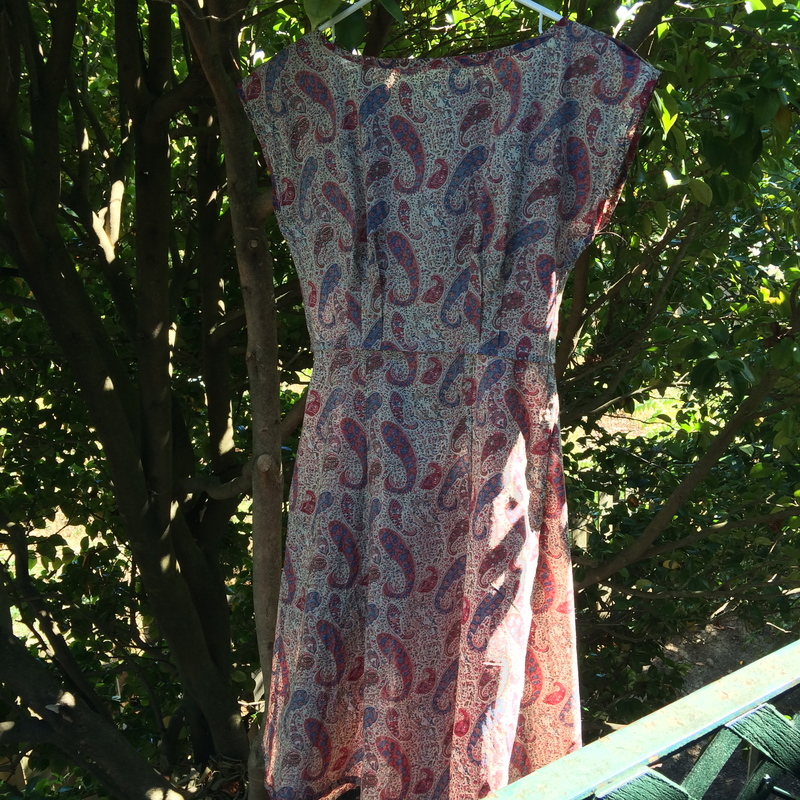 But what with full time work I didn’t feel like I had a great deal of time to sew at all, much less things that weren’t related to the fast approaching bridesmaid-dress deadline, and so my dress came out a little slapdash and messy as I tried to cut corners. 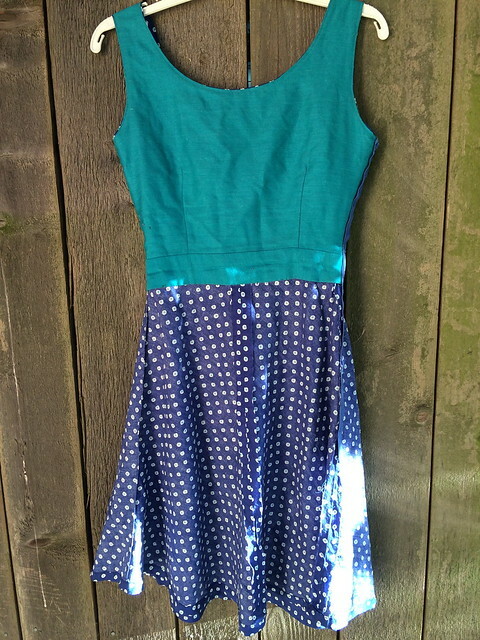 The fabric is a Lisette lawn that my mother gave me, with rough, almost diamond-shaped white polka dots that have little teal polka dots in the centers. 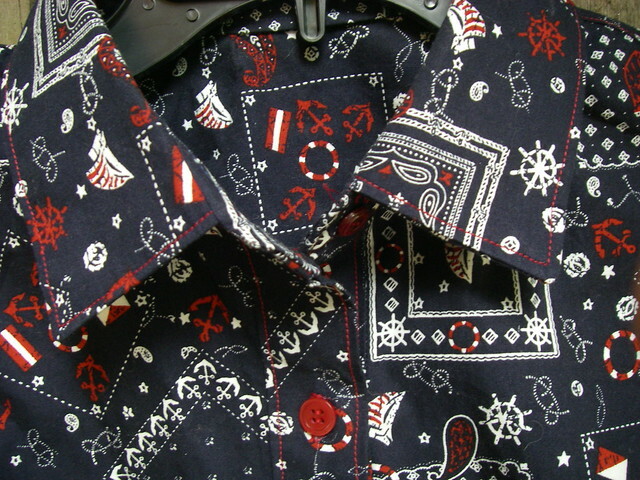 The pattern is a mash-up of my own invention. I knew when I saw the fabric that I wanted a fit-and-flare with a sweetheart neckline, a waistband, and a bias-cut skirt (a la the Sewaholic Hollyburn). 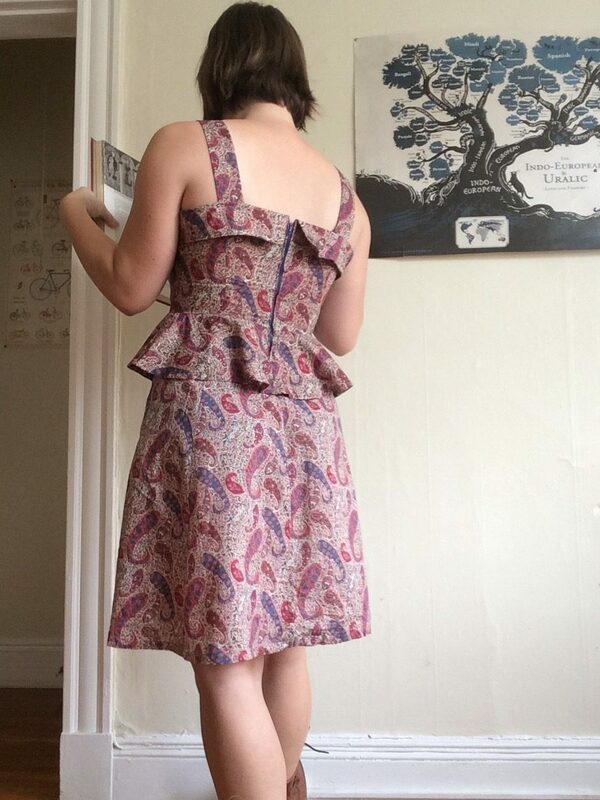 The bodice was easy, as I used a heavily modified version of McCall’s 5927 (I added the sweetheart, and scooped out the back, and shortened it to accommodate a waistband), which I used for my bridesmaid dress–that way I could call it a wearable muslin! 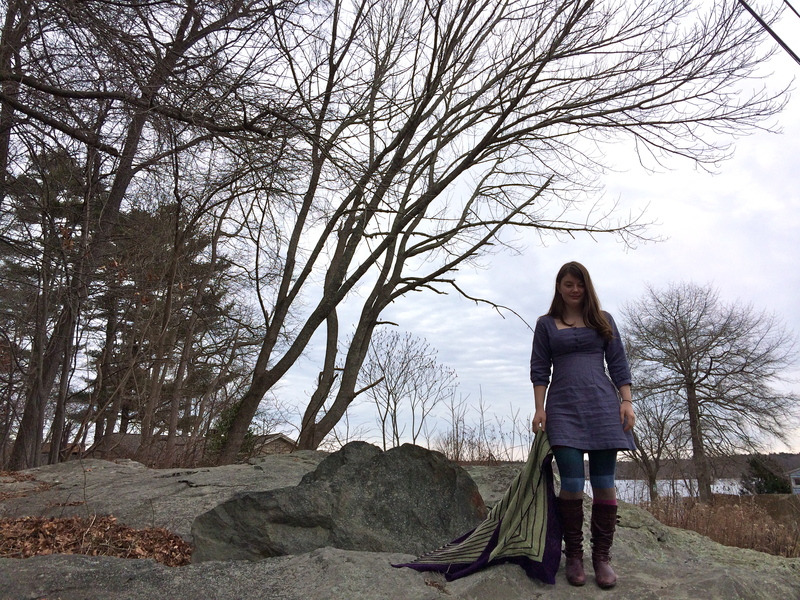 The skirt was trickier–I wanted a Hollyburn skirt, but I can’t justify spending money on such a simple skirt pattern that I could draft myself. 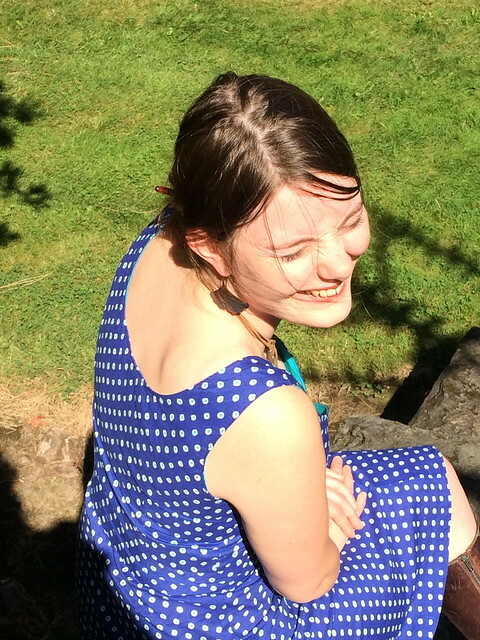 BUT, I couldn’t just draft it myself without feeling guilty, because you’re supposed to support indie pattern designers and all that, rather than blatantly copy their designs. Which I would love to do, if I could afford it, but I can’t. 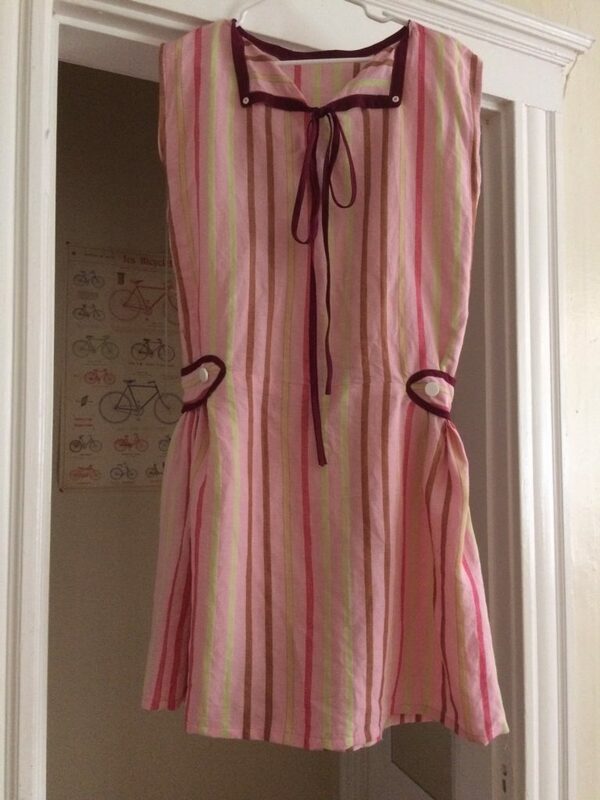 The slapdash nature of this dress means that it is definitely not without its problems. I need a giant swayback adjustment to my skirt pieces, and the hem is longer in front than back due to the swayback (easily fixed though). 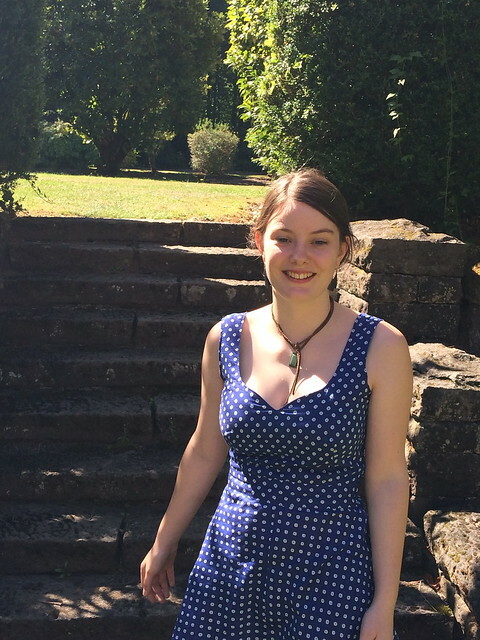 The bodice is a little tight in the bust (and after looking at these pictures, damn it is low cut), and the waistband is about half an inch too long. I made a hot mess of the zipper since I didn’t want to “waste” too much time handsewing, and the pattern matching on the center seams is, frankly, abysmal. Another thing I noticed is that the back gapes whenever I put my shoulders back, which does not exactly encourage me to improve my posture! See? Gaping! Any suggestions on how to fix this? Should I take out width and risk it being too tight, or is this just normal on low backs? OH WELL! 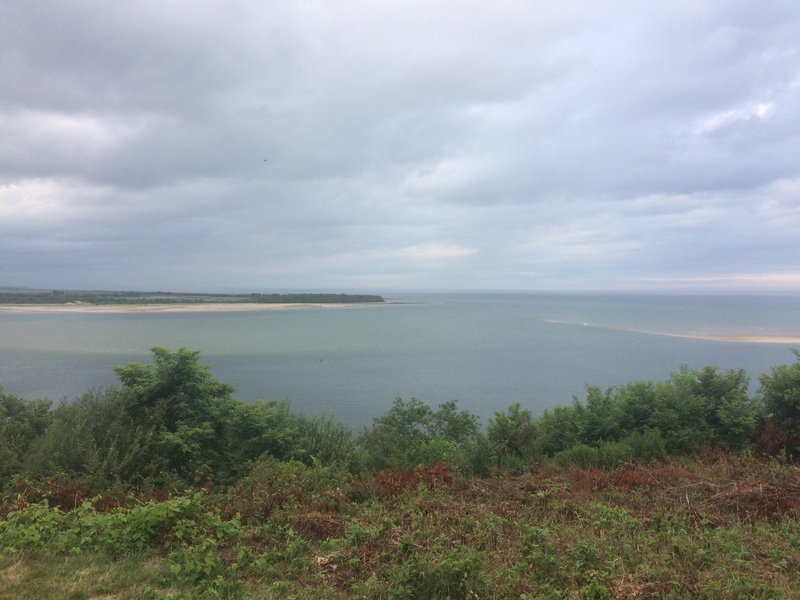 I still think it’s pretty. And since we will eventually be going into cooler weather, the flaws will mostly be covered up by sweaters, so no harm done. And the insides are tidy. There will be some retroactive seam finishing when I get my zigzag machine back from the shop, but it hasn’t fallen apart yet, so we’ll count it as a win! 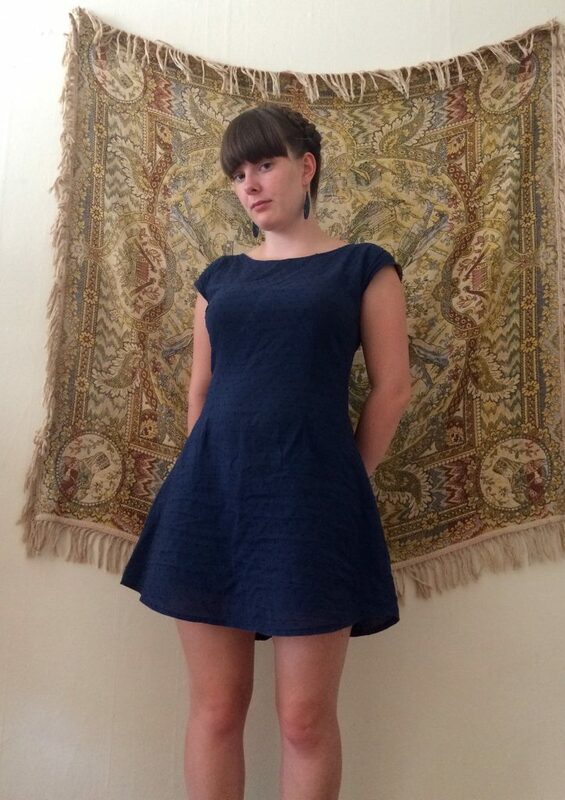 This entry was posted in sewing and tagged dress, sewn on September 19, 2014 by Alice. 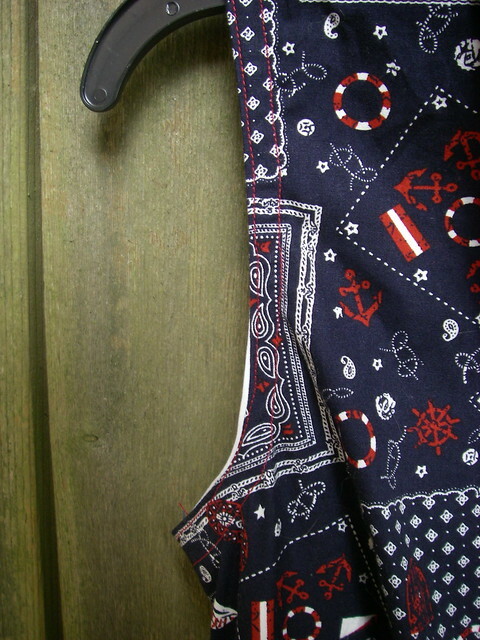 Last winter I decided to make this nautical broadcloth into a breezy summer shirtdress–isn’t it funny how I always have the urge to make sundresses in the dead of winter, and once summer gets into full swing all I can think of is tweed and tights? 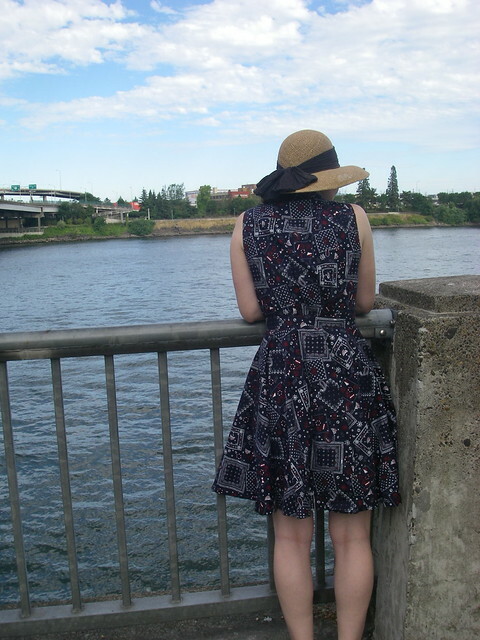 In any case, I was without a sewing machine for a solid three months, and so by the time I was able to realize the dress, it was practically summer here in Portland. 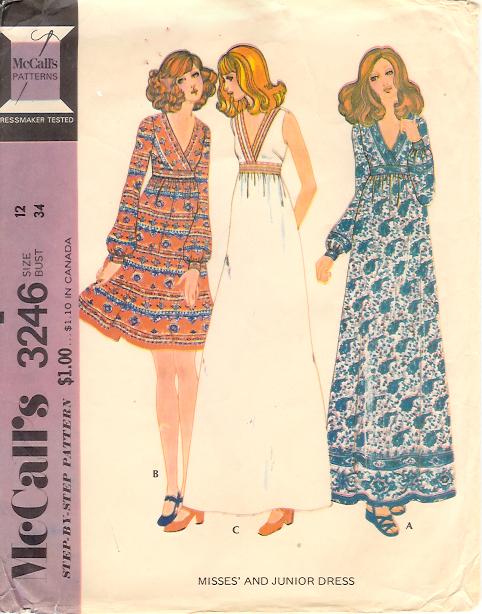 The pattern, of course, is McCall’s 6696, as that is the only shirtdress pattern I have. 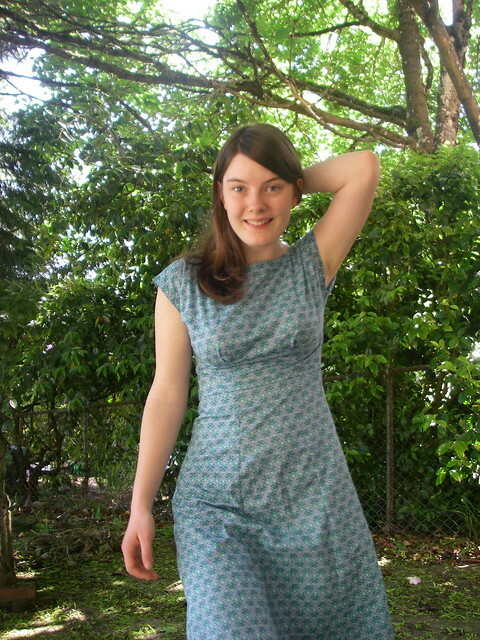 (I’d like to try the Hawthorn, but I don’t really know if Colette patterns will ever fit my small upper body.) 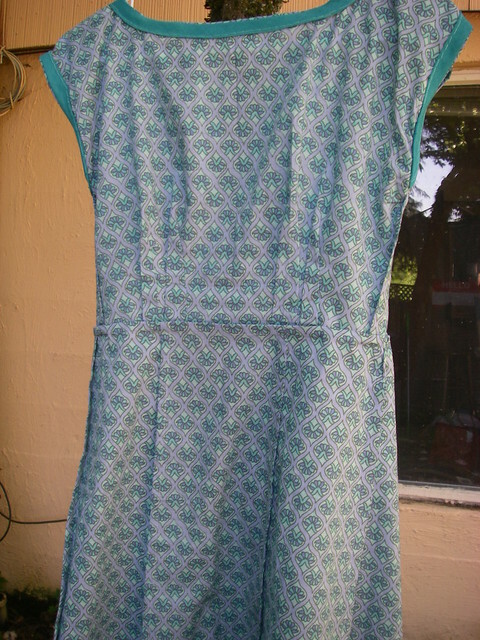 I made some adjustments from my green shirtdress, taking in the waist, lengthening the darts, and trying to make the whole thing generally smaller without tracing a smaller size. 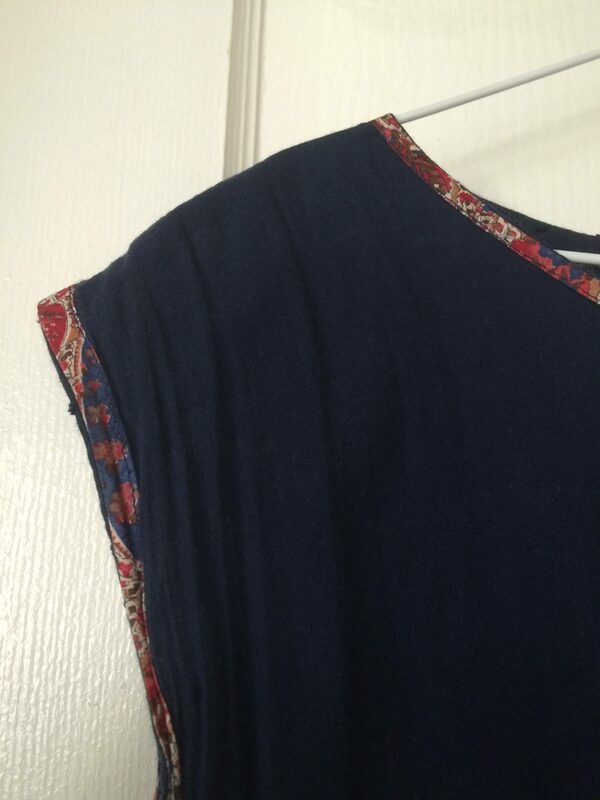 I also left off the sleeves, obviously, but the armholes are somewhat too large. 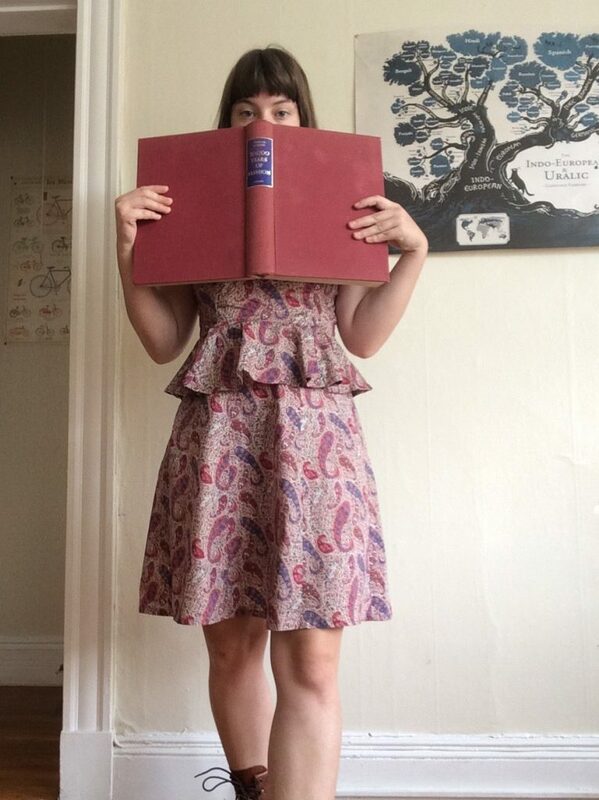 I left the back gathers, but combined with the too-big armscyes and my forward shoulders, I feel like it makes the dress look too big and my shoulders look very round. It may be too late at this point, but I might go in and take some of the gathers out because I just don’t care for the way it looks. 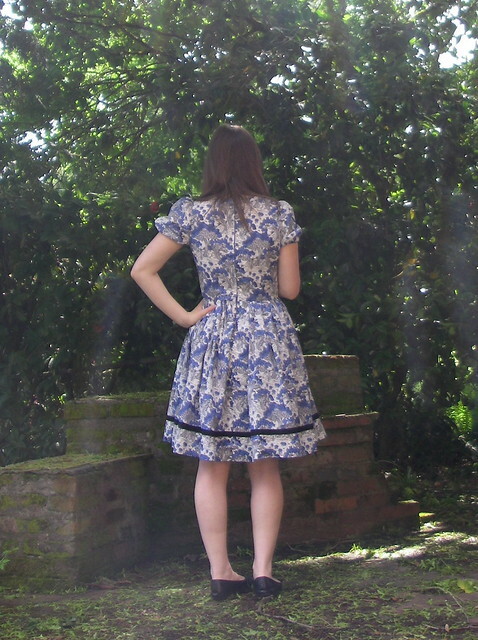 I used a circle skirt instead of either of the pattern options, because it looks good with a petticoat, and I don’t need a pattern piece for it (the truth comes out! 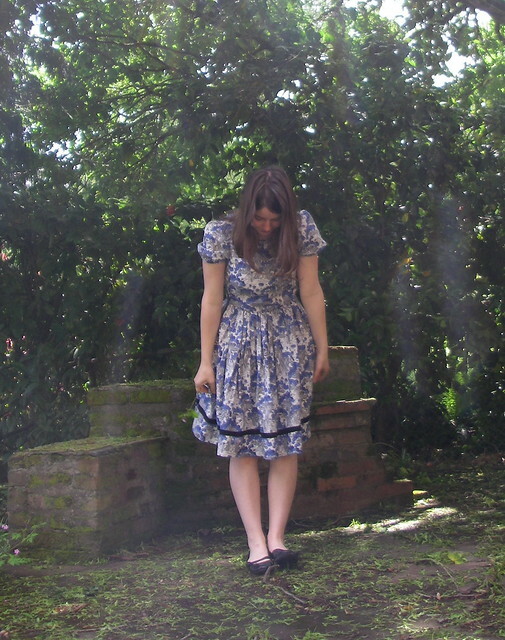 I wear circle skirts all the time because I’m too stingy with my tracing paper to use patterns). I gave the waistband some negative ease, because that’s what I like, but unfortunately forgot about the inevitable gaping that would result. A couple of hooks and eyes fixed that easily enough. 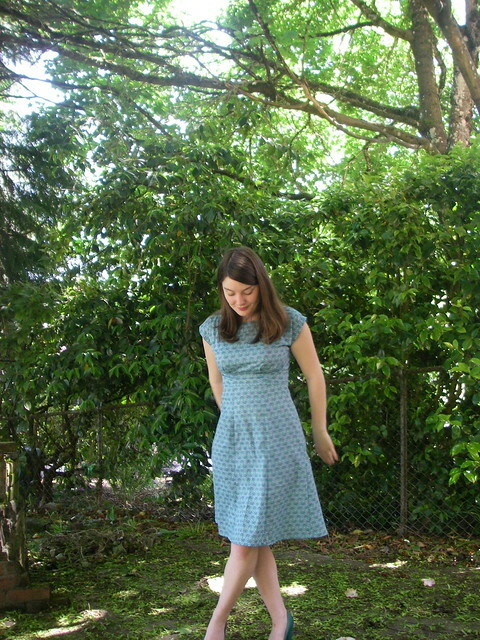 When I started this dress I was using only my straight stitch machine, and dreading the buttonholes. Then I found a vintage Kenmore with an awesome buttonhole attachment for only $20! 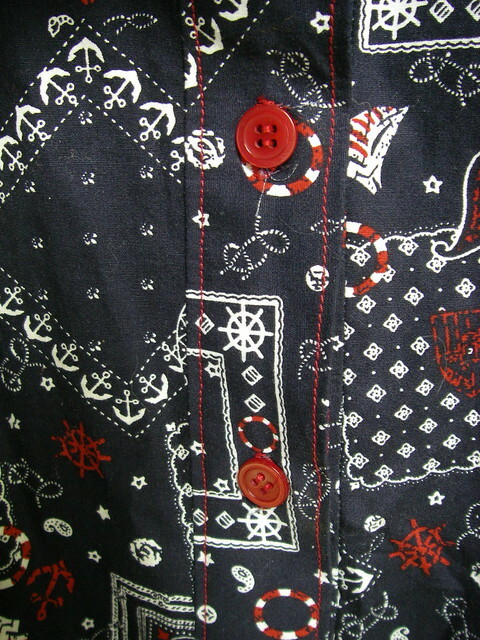 Now it’s broken, and I’m not sure how to fix it, but at least I got two garments worth of buttonholes out of it… And the buttons match so well! 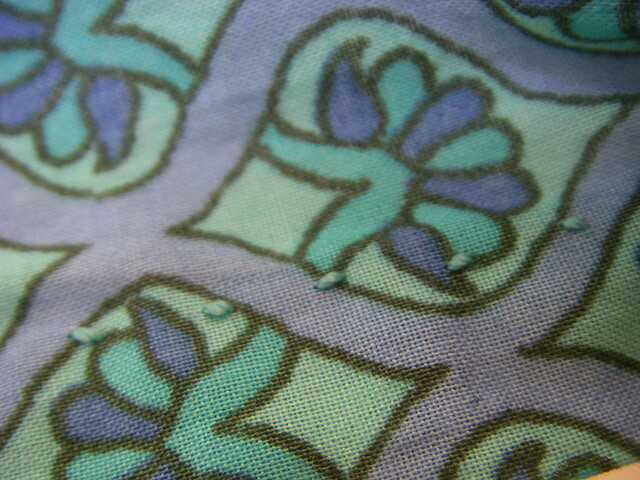 What else… I put the armhole binding on flat, thinking it would be easier that way, but neglected to understitch, so it rolled. Oops. Luckily it’s a busy print. I also tried to fix the collar drafting issue that my last iteration of this pattern had, but even with pinching an inch out of the collar and collar stand pieces, they were still too long! It’s a good thing I never button the top button anyway. 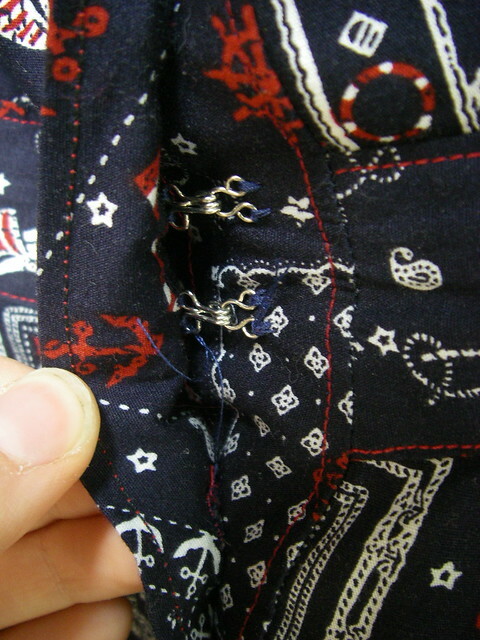 I didn’t even bother making the buttonhole functional. Overall, it’s not perfect (nothing ever is), but I like it a LOT. 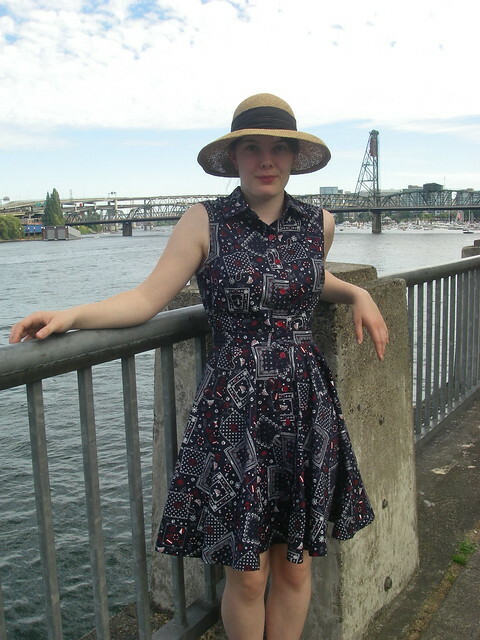 It’s a good casual dress (worn here with my fantastically grubby Converse), but it also looks great with red lipstick and red heels, and as soon as Zappos restocks those red saltwater sandals in my size, it’ll be a perfect summer outfit! 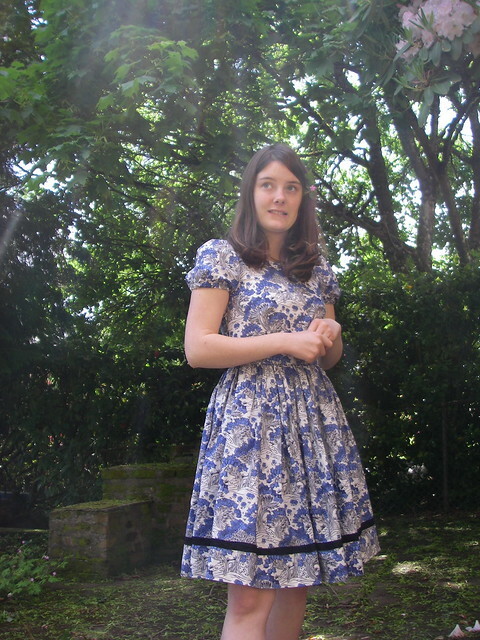 It’s also lots of fun to wear with my giant red petticoat. 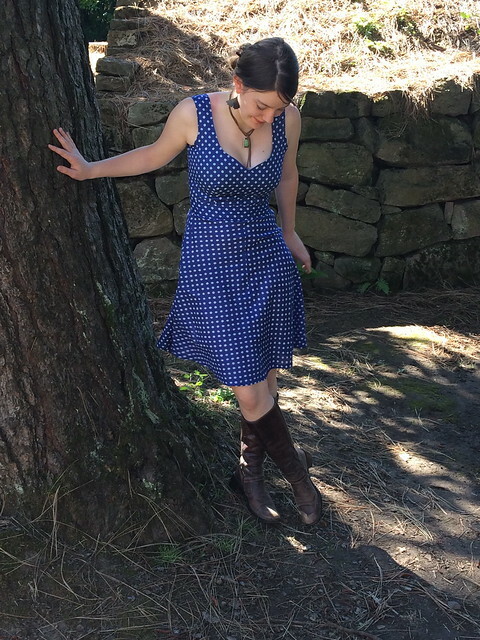 I’m not sure how well it will transition to winter, as there is a distinct lack of red cardigans in my closet, but it’s definitely a winner for hot weather. 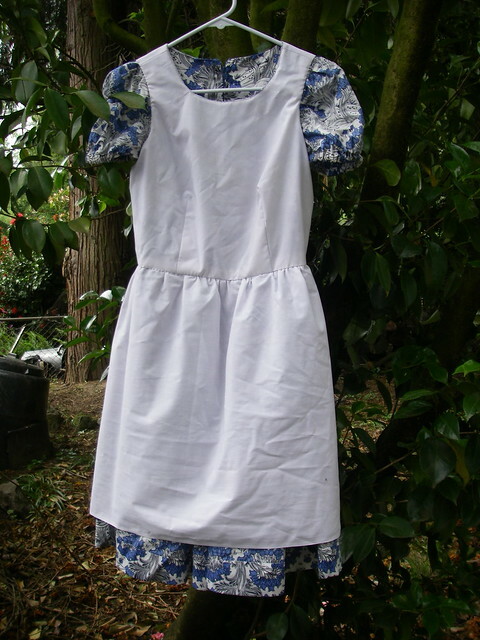 This entry was posted in sewing and tagged dress, sewn on July 31, 2014 by Alice. 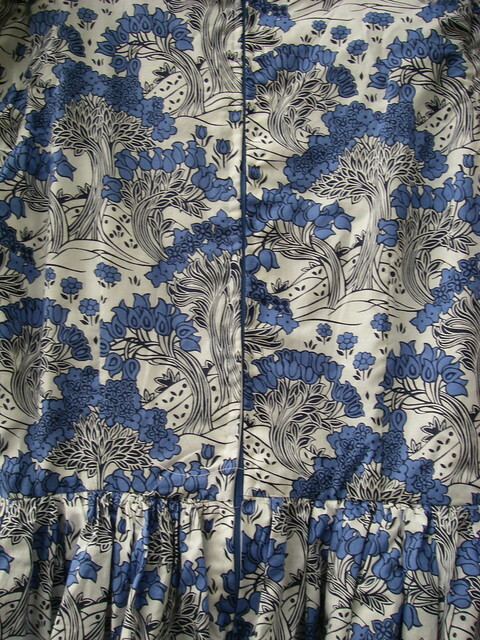 This fabric is a Lisette lawn that my mother bought for me nearly two years ago, which I have been saving until my sewing skills improved. 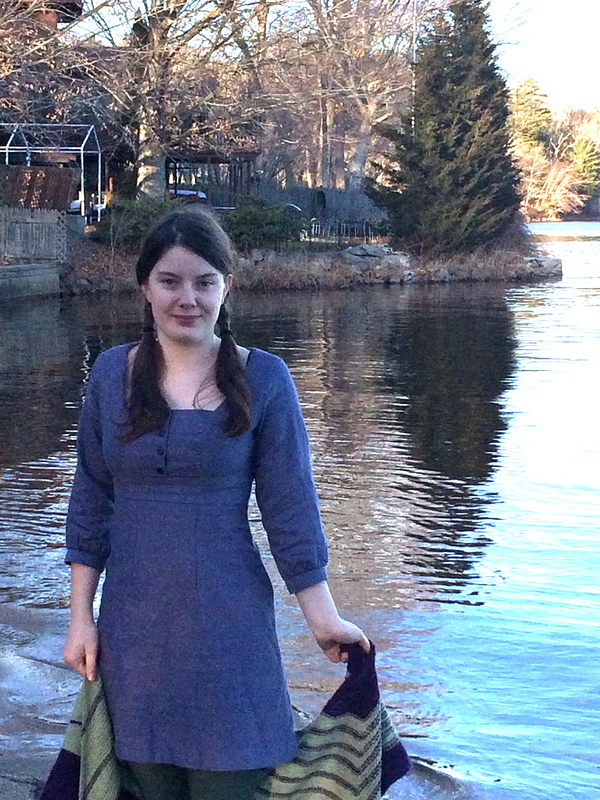 It was originally destined to be a maxi-length McCall’s 3246, but I have yet to get that pattern fitting perfectly. 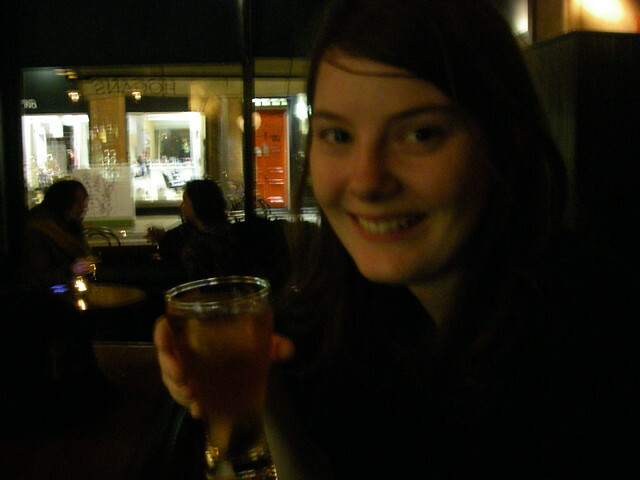 Or maybe an Ashland? 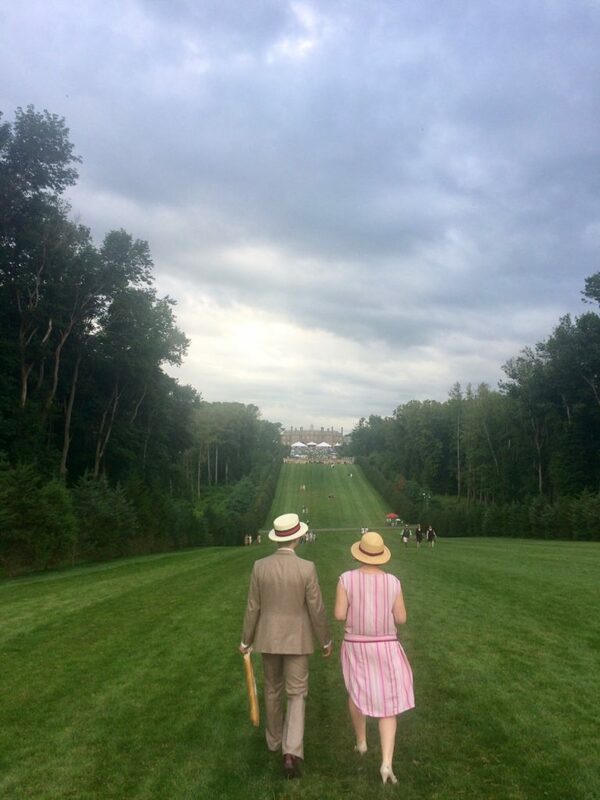 But in the end, it was paired with Anna! And I think they suit each other very well. There is relatively little to be said about the process. 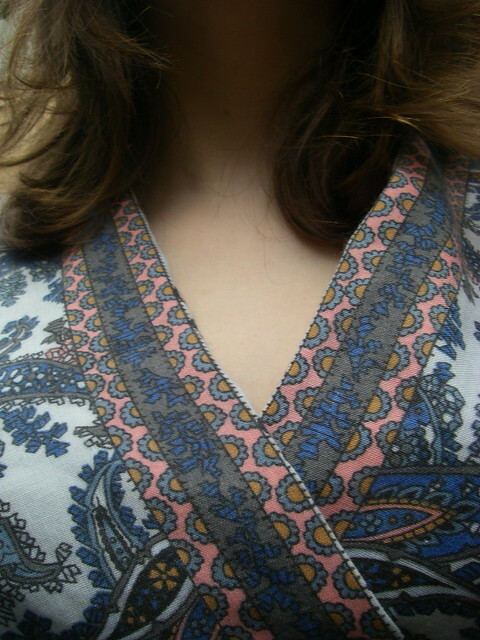 I narrowed the neckline by about 1/4-1/2″ on either side, to fix the gaping I got on my last Anna. 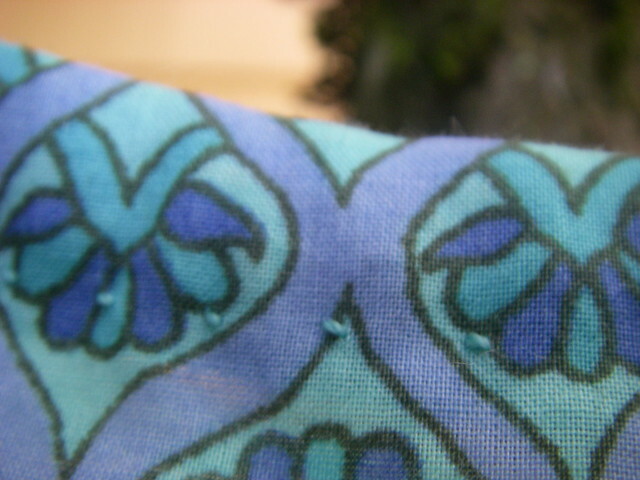 Neckline and sleeves are bias-bound, with decorative turquoise prick-stitching, which also features on the zipper and the hem. 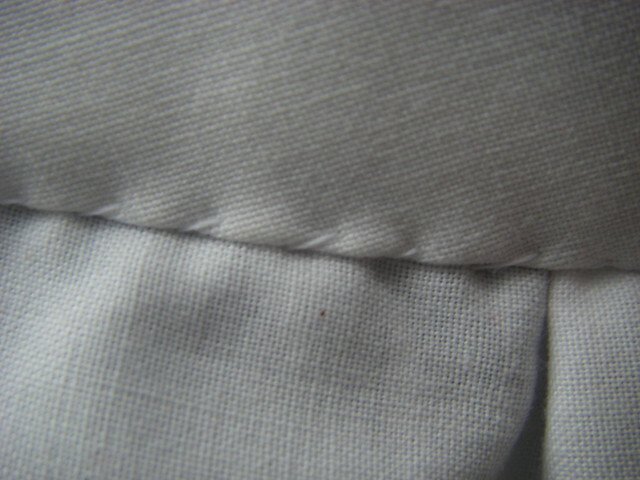 The inside is entirely french-seamed. 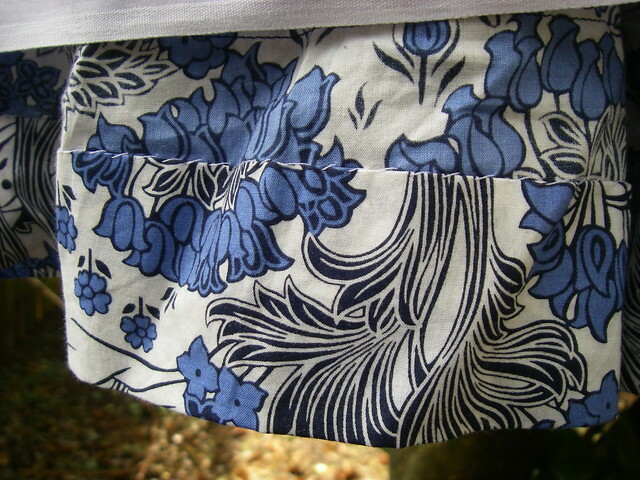 On my last Anna, I had stitched the side-seams at 1″, but as this one doesn’t have any stretch, I stitched them at 3/4″. 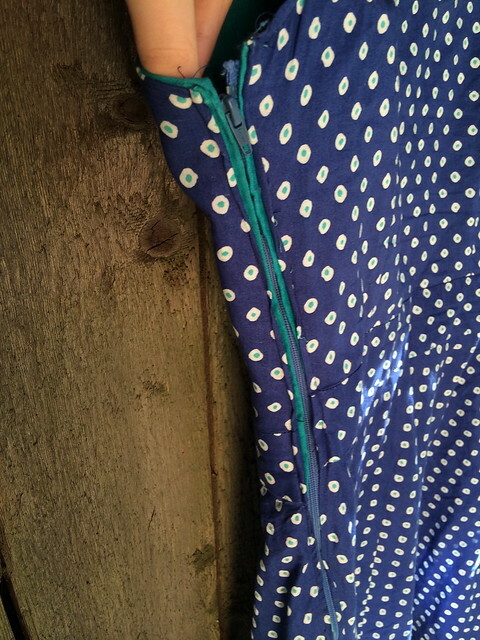 I must have forgotten to do so on my skirt seams, or something, because none of the seams match up at the waistline, but luckily the fabric is busy enough that no one is likely to notice. 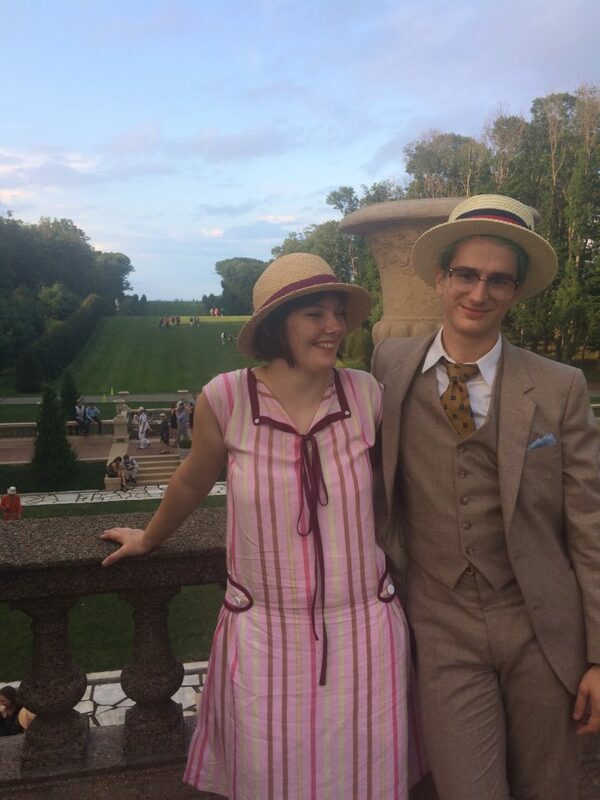 I have about a yard left of the fabric, which may actually be plenty for an Ashland if I felt like it. 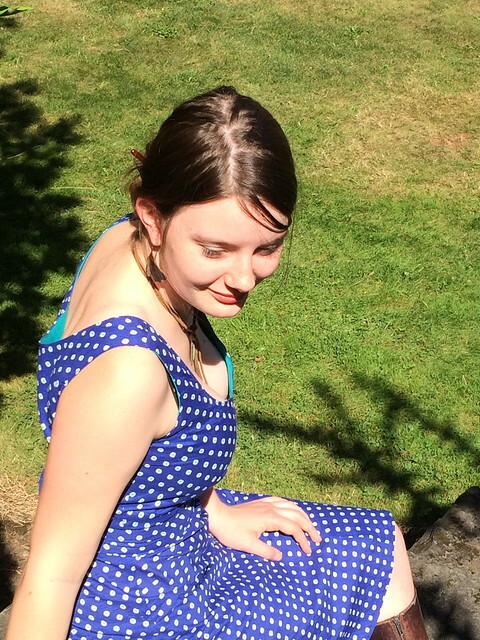 Or a high-waisted gathered skirt…? Or something else entirely. 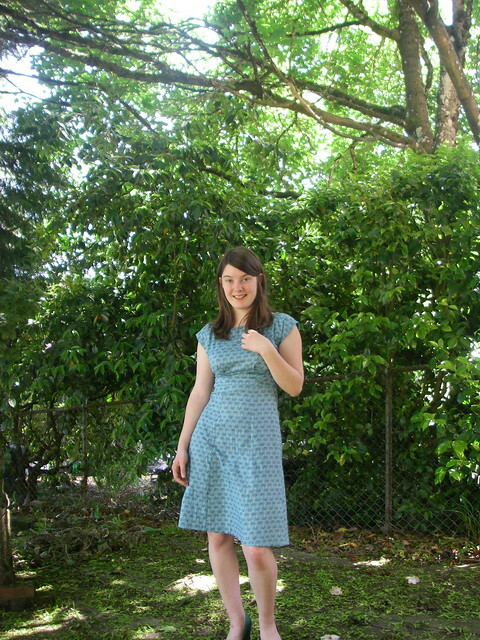 This entry was posted in sewing and tagged anna dress, dress, sewn on May 15, 2014 by Alice.